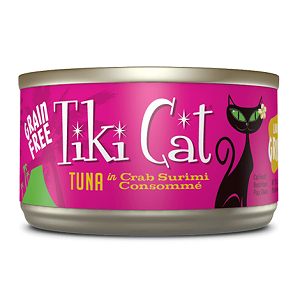 Tiki Cat Gourmet Whole Food Brand Cat Food Lanai Luau is shredded Ahi Tuna topped with Crab Surimi prepared in Crab Surimi consommé for a grain free, gravy free, zero carb meal. Complete and balanced diet for all life stages, feeding 2% of body weight per day to maintain weight. Typically feedings include one 2.8z can in the morning and evening per day or a 6.0z can split between 2-3 cats per day in the morning and evening. Great to feed solely or to supplement a dry food diet by adding the missing moisture and boosting the necessary protein and fat levels missing from kibble.